I spent much of the day writing to and waiting to hear from Rick. Otherwise, I was making trouble. The groundwork laid for a mutiny: I spoke earlier to ship personnel and lobbied the guests who were at the Captain’s dinner table on Wednesday. ‘Why? Why can’t we stop, mid-sea, and lower the swimming deck?’ The only reason I could see was that ‘it wasn’t done, wasn’t protocol.’ I wandered the ship urging folks to grumble. Midafternoon, on Thursday, Sea Dream paused, dropped anchor, and announced over the loudspeakers that there would be swimming. Scattered pockets of the most devoted swimmers, literally, cheered and flashed Victory signs. Within 10 minutes, passengers were dropping into the amazing Adriatic like the early pattering of summer’s first hailstorm. Soon the ink blue, calm surface of the water was patterned with confetti of multi-colored pool noodles. There were maybe 60 people (more than half the guests) splashing and high-fiving Gretchen and me. Wild rebels at sea! 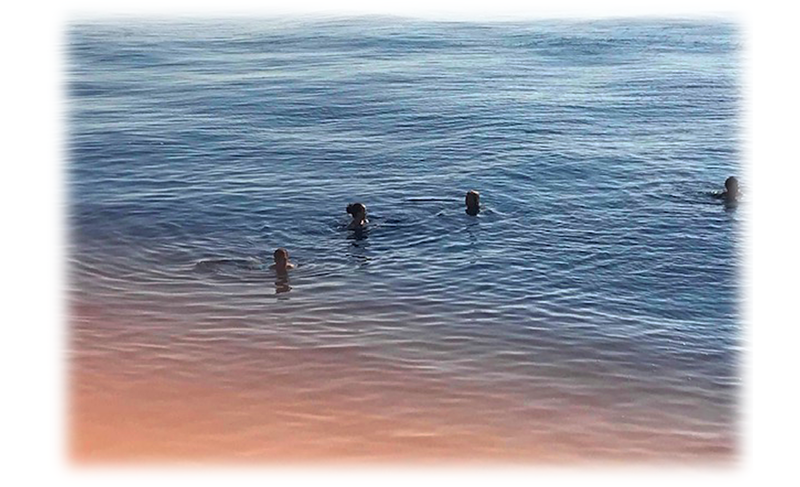 From above, the almost wave-less Adriatic looked dark blue, but the water, itself, was clearer than air—our swimming bodies seemed suspended in ether. A joyful late afternoon spilled into a celebratory evening.